“The future ain’t what it used to be.” …..Yogi Berra. 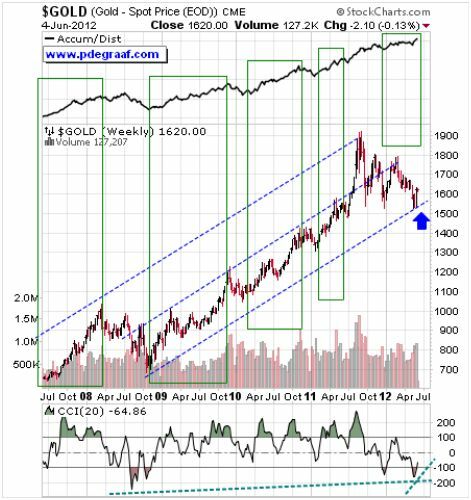 This weekly chart courtesy Stockcharts.com features the gold price rising within the blue channel and the Accumulation/Distribution line at the top. The green boxes show the historical connection between the gold price and the A/D line. Whenever the A/D line rises (as now), price usually follows. The fact that the A/D line has been moving up since the beginning of 2012 puts pressure on the gold price to ‘get in step’. “There can be no other criterion, no other standard than gold. This chart courtesy Dimitri Speck. 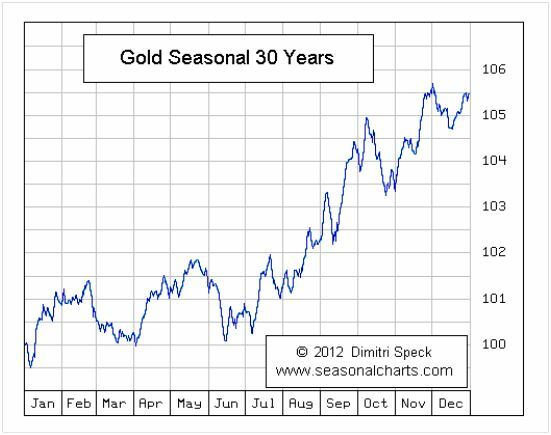 It shows the seasonal tendencies for gold based on data going back to 1982. Quite often the gold price produces a low in June and rises from then into February. 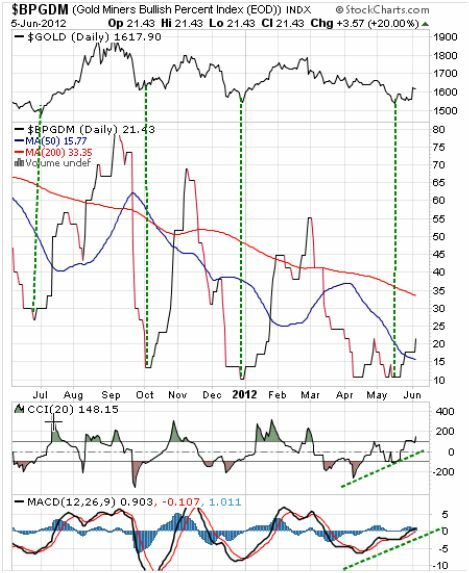 Featured is the Bullish Percentage Index based on the Gold Miners Index ($GDM at Stockcharts), with the gold price at the top. 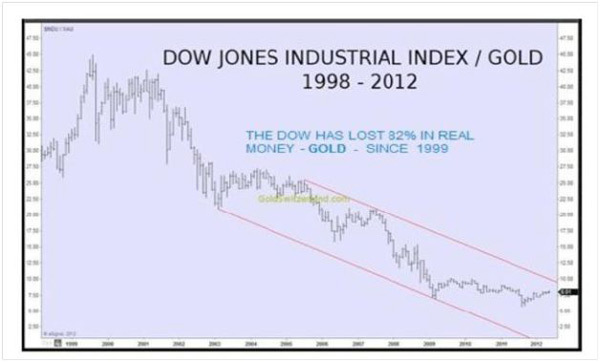 Historically whenever this index turns up from below ‘30’, it is matched by a rise in the price of gold that lasts several months. 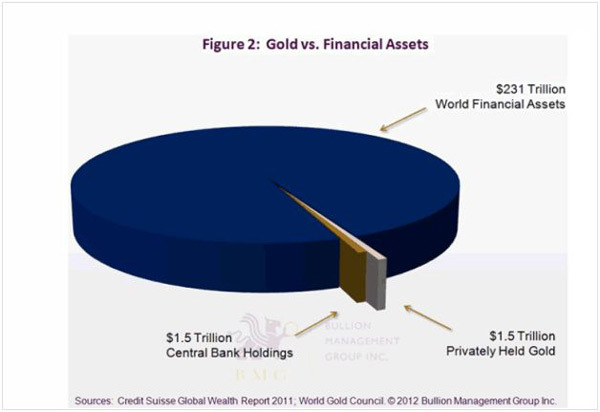 This pie chart is courtesy Bullion Management Group Inc. It shows shows gold to be a tiny part of the world’s investment holdings. The potential for investors to switch from other investment vehicles into gold is tremendous. “The real cost of the state is the prosperity we do not see, the jobs that don't exist, the technologies to which we do not have access, the businesses that do not come into existence, and the bright future that is stolen from us. The state has looted us just as surely as a robber who enters our home at night and steals all that we love.”….Frederic Bastiat. Featured is the weekly silver chart courtesy Stockcharts.com. Silver is noted for the large pennants that are produced time after time. One such pennant is being carved out at the present time. At the top of the chart is the Accumulation/Distribution (A/D) line. Historically whenever the A/D line rises, it pulls price up with it. 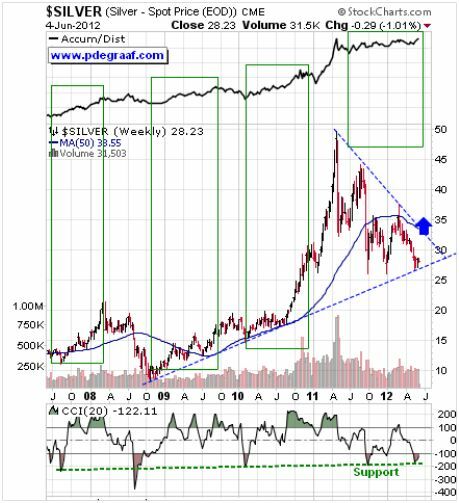 For the past few months the A/D line has risen and silver has not yet followed. Unless one expects the A/D line to decline rapidly (no sign of that), there is now strong pressure on price to ‘get in step’. During the 1960’s at the time when silver was removed from circulating coinage, the amount of silver stockpiled around the world was about 6.5 billion ounces. In 1980 the stockpiles of silver bullion were estimated at 2.5 billion ounces. Since then an estimated 13 billion ounces have been mined, while an estimated 15 billion ounces have been used up. Silver in most industrial applications is not yet valuable enough to be recovered for recycling. For decades the amount of silver that is mined has failed to meet the demand for silver. In the meantime the uses for silver continue to expand. Today, if just one billionaire decided to buy 1 billion dollars worth of silver, he would have a hard time getting his order filled. In the process this order would cause a massive price increase. 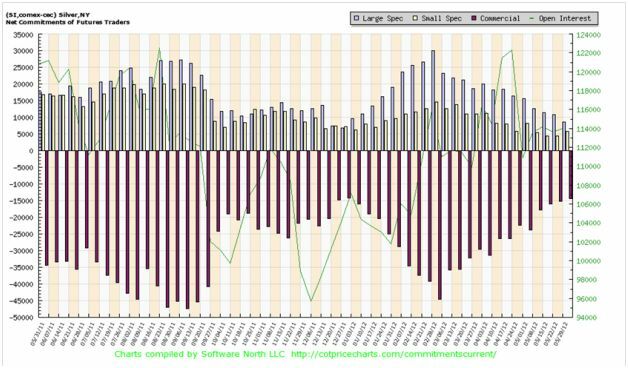 This chart courtesy Cotpricecharts.com shows the ‘net short’ position of commercial silver traders is at its lowest (14,000 compared to 15,000 last week), since December 2011. Silver was trading at 27.86 at that time, and during the following two months the price rose to 35.14.